200% up to €200 Video Poker bonus. 300x clearing rate for video poker. 90 day timeline to clear. 888 offers a 200% up to €200 bonus for video poker players, with a 300x WR of your deposit and bonus. This means a €100 deposit will net a €200 bonus, and would have to be cleared as shown: (€100 + €200) * 300 = €90,000. So €90,000 total would need to be wagered before a cashout. Playing €.50 video poker, with a €2.50 max bet, that would take a total of 36,000 hands. Ladbrokes offers video poker players a 100% up to £500 bonus with a 200x WR for deposit + bonus. So the max bonus offer, will need to be wagered as shown: (£500 + £500) * 200 = £200,000. If you play £1 video poker, at £5 max bet, it would take you 40,000 hands. No bonus code required, bonus may take 48 hours to appear after your deposit. Cashout voids bonus and winnings before WR is met. You can cash out your deposit, bonus, and profit once WR is met. Some countries have different terms. Other currency options available. Bonus expires in 30 days. Video Poker is a simple form of poker offered at nearly every casino where you play against the house. The game comes in many different variations, but every version follows the similar draw poker structure. In most variations, you are dealt 5 cards, and can decide to keep or discard any of them, then draw new cards to end up with a final 5 card hand. How much your final 5 card hand pays out depends on the paytable, which we describe below. This single player game is very fun and addicting and is strategy based, meaning making the correct decisions will win you more money in the long run. Video Poker isn’t like playing at a slot machine where everything is random. You have to think and make the right plays, and in some cases, you can even beat the house! Since Jacks or Better is the most popular Video Poker variation, we’ll be using it to explain how the game should be played. Most Video Poker variations are not that different from each other, so by learning to play one, you will then be able to intuitively figure out the others. An important part of any Video Poker game is the payout table. Payout tables show the payouts for hands and are based on how rare the hands are and the game variation. In Jacks or Better, the payout table starts with a minimum hand of a pair of jacks. Pay table from 9/6 Jacks or Better.Note the five columns in the payout table. Each column corresponds to the amount of coins you are playing on a single deal. The amount ranges from 1 to 5 coins and even though payouts for all hands are the same, except the Royal Flush. Hitting a Royal Flush pays an extra bonus on the 5-coin payout table, which is quite significant. For this reason, it is always more profitable to play the maximum amount of coins on a single deal. So, to begin with, you have to select the payout table which you are going to be playing. You can change how many coins to wager per hand.Next, you have to select the value of a single coin. In this case, we’ve selected a value of $5 for each coin, so if you are playing 5 coins at $5 each, that means that you bet $25 on each hand. You should always bet the max of 5 coins per hand!Once the payout table and coin values are selected, press “Deal.” You will be dealt 5 cards and you can hold any cards you want or discard all of them. A dealt hand of Jacks or Better.After you have made your decision, press “Draw.” All the cards which you did not choose to hold will be discarded and you will get dealt new cards in place of them. The cards you held and the cards that you have been dealt after the draw will represent your final hand combination, which pays out according to the payout table. Player wins with a pair of Aces.In this case, we had a Pair of Aces after the initial deal and the draw did not improve our hand. Therefore, the final combination remains a Pair of Aces. According to the payout table, a pair of aces pays 5 coins. Another feature of the Jacks or Better game, which is also found in a lot of other Video Poker variations, is the Double feature. 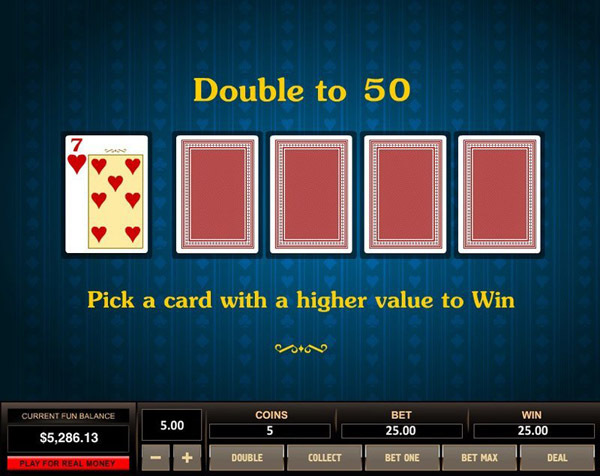 After you have made a hand of a pair of jacks or better, you can choose to play for double or nothing. One card is dealt face up, while four cards are dealt face down. You can pick any one of the cards which are face down and if your pick will be higher than the face up card, your winnings will be doubled, otherwise your winnings will be lost. You can choose to double or nothing your winnings.This will give you a 50/50 chance to double your winnings, or lose them all. It’s completely up to you if you want to risk it, and since there is no house edge, it is a completely 0EV bet. 0EV basically means it’s a neutral play. Declining or accepting the double up does not add to or subtract from your return. However, this is a high volatile play, an increase in the variance. I usually disable it, but if you feel like gambling, and can afford to, go ahead and take the risk! If you’re new to Video Poker, you might need some examples of what the names of the poker hands in the pay table actually mean. A high card hand is essentially a no hand, with the highest of five cards playing. As you have probably guessed, high cards don’t pay anything in Video Poker. One pair hands contain two cards of one rank, plus three cards of different rank and not the same as each other. Video Poker game payouts usually start with a pair of Jacks. However, there can be variations depending on the game. Two Pair is a hand that that contains two cards of the same rank, plus two cards of another rank, plus any card not of either rank. Three of a kind contains three cards of the same rank, plus two cards which are not of this rank nor the same as each other. A straight is a hand that contains five cards of sequential rank with different suits. A flush is a poker hand where all five cards are of the same suit, but not in sequence. A full house contains three cards of one rank and two cards of another rank. Four of a kind contains all four cards of one rank. A straight flush contains five cards in sequence, all of the same suit, except for ace-high straight flushes. The best possible hand in poker, a Royal Flush contains five cards of the same suit in sequence from ten to ace. Return refers to the average amount a player can expect to receive from playing a certain casino game. 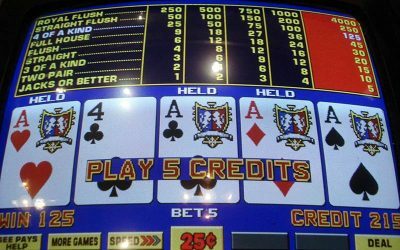 Typically, Video Poker offers one of the highest returns out of all casino games and players can easily find out the return of any Video Poker game before they start playing it. For example, 9/6 Jacks or Better offers a 99.54% return. Some Video Poker games even have a 100%+ return, which means that they are actually profitable to play, though they are hard to come across and even harder to master. This 99.54% number means for every $100 you invest, you can expect to receive $99.54 back by playing perfect strategy. Add in any perks or comp points for playing at the machines, or if you’re able to find a good machine that offers a progressive jackpot, and you can turn this into 100%+. 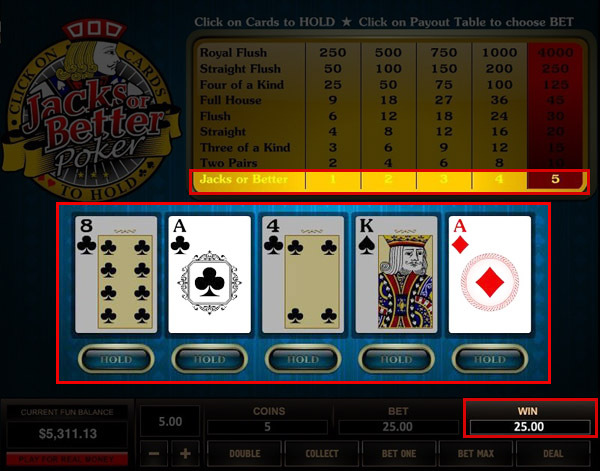 While the most popular game Jacks or Better doesn’t have many twists to it, there are other Video Poker games where things like Wild Cards and Jokers are included, such as Joker Poker or Deuces Wild. Typically, Wild Cards substantially increase a players chances to hit big hands, so those games can be really fun. If you want a shot at a really big prize, then you should look for Progressive Jackpot games. These can be lone Progressive Jackpot games or they can be interlinked in a group, with each game participating donating a small cut to the Jackpot. You can also find Multiple Hand games. In case you get bored playing just one hand at a time, why not try out one of these games and fire up two, ten or even more hands at a time. So as you can see, Video Poker games come in all shapes and sizes and each one usually requires a different strategy. The best approach is to choose a game you like and then study the best strategy for it. If you are new to Video Poker, we recommend starting out with Jacks or Better, since the strategy for it is relatively easy to learn. Not all video poker machines are created equal. Learning how to play the game isn’t the only thing that matters. You also have to learn when to play the game. Above, I referred to a video poker variant as “9/6 Jacks or Better”. The 9/6 part means a Full House pays 9 and a Flush pays 6 for a 1 credit bet. This is usually where you will see differences in the pay tables on various video poker machines. As you can see, you will lose about $3.39 more per $100 wagered at a 7/5 machine than at a 9/6 machine. It’s very important to pay attention to the paytables! I’ve seen people crowding around 8/5 machines when 9/6 were available in a different area of the casino. Most B&M casinos will offer 9/6, but usually hidden in the back and only at higher stakes ($1+ per coin). It’s much easier to pick and choose online and find the best paytable for your bet. – First and foremost, always bet the max! Your return decreases drastically betting 1-4 coins. You must always bet the 5th coin to get maximum value. This is because of the royal flush bonus with 5 coins. – Never hold a kicker. If you have been dealt two kings and an ace, throw it away, since you need to maximize your chances of hitting three of a kind or four of a kind. – Small pairs are more valuable to hold than a single ace or two cards to a Royal Flush. However, you should always hold three to a Royal Flush rather than a small pair. – Always hold Jacks+ over any Flush or Straight draw and over three to a Royal Flush draw. – Try to avoid drawing to a gutshot straight draw (where only one card can complete the straight). If you have any other drawing options, use them instead. – Never draw three cards to a straight or a flush. This is a very bad mistake. The chances of you hitting your hand by drawing two cards is slim and the payout for a straight or a flush make this a very costly move. – Always hold four cards to a Royal Flush, even if you have been dealt a Flush or Straight. The only time you don’t go for the Royal Flush in this situation is if you have been dealt a 9-K Straight Flush. These are just a few tips that players who are new to the game should know. 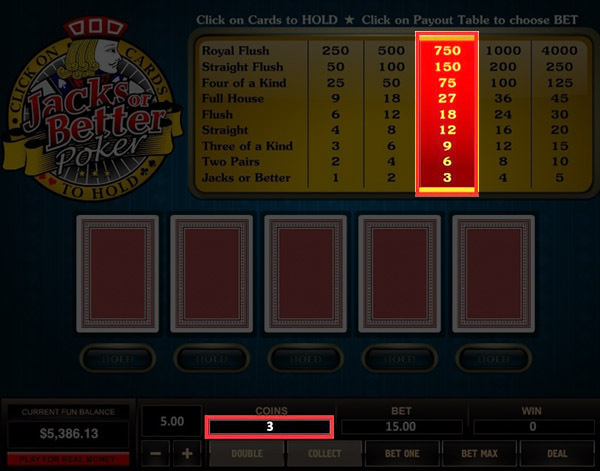 Video Poker isn’t a game like Blackjack where you can follow a small chart to play perfectly. There are too many variables, so in order to get good, you need to practice. 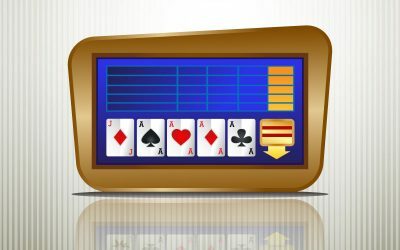 The best tool we’ve found to help improve our video poker game can be found at VideoPokerTrainer.org. This website simulates a video poker game and, while playing, tells you if you made the correct or incorrect decision. If you make a wrong play, it will also tell you what you should have done. Think you know the optimal play? Or trying to get better? This tool will be invaluable! The site also offers a calculator which will tell you the top seven plays for any dealt hand. Check it out! 888 is based in the UK and is one of the leading online gambling operators, providing players with everything from poker to sports betting. 888 provides a nice selections of Video Poker games, as well as promotions for new players. Want to learn more? Check out our 888 Casino review. Claim Your Video Poker Bonus Now! Video Poker machines go back to the early 1970s, when the computer industry was in its infancy. Commonly referred to as the Poker Slots back then, initially, Video Poker struggled to become an integral part of the casino. However, despite the inherit similarities to Slots, the fact that Video Poker had a crucial difference – the element of skill – helped push Video Poker forward in the next decades. At the beginning of the 1980s, Video Poker machines were springing up all over the place, becoming the most popular addition to casinos. The very first Video Poker game was Draw Poker, featuring the lowest possible hand of Two Pairs. Later, the lowest hand was changed to a Pair of Jacks or Better, which boosted Video Poker’s popularity even further. In fact, Jacks or Better remains the most popular Video Poker game up to this day. 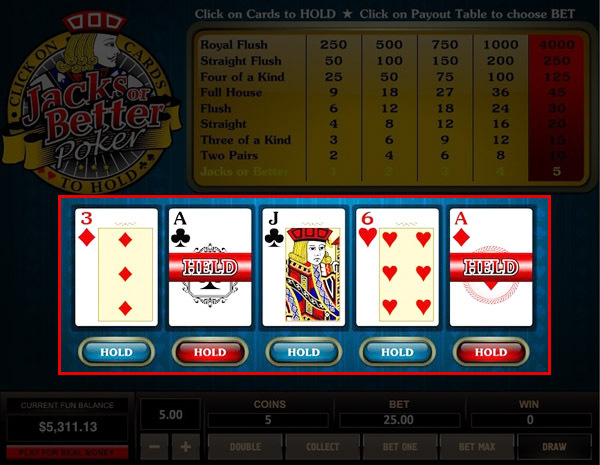 Even though Jacks or Better remained at the top of the Video Poker world, nowadays you can choose from literally hundreds of Video Poker variations and thousands of pay tables. So even if you don’t find Jacks or Better particularly appealing, you will have a wide range of other games you can try out.